Striper fishing has been the best for those fishing from a boat at Lake Mohave. ■ Lake Mead — High temperatures are keeping the fish in deeper water and out from the shoreline shore during the day, but the fish are coming after the sun goes down. Early risers are seeing boils in and around the coves. Sassy shads, Zara Spooks and Jumpin’ Minnows are good top-water options when fishing boils. Anglers have found success for stripers along the tires near the marinas. Black bass fishing remains fair to good in the Boulder Basin and in the Callville Bay area, where anglers are catching a mixed bag of largemouth and smallmouth bass. The fish are hitting crankbaits and soft plastics. Catfish are taking almost anything and are most active at night. ■ Lake Mohave — Striper fishing has been the best for those fishing from a boat. The fish mostly are in the 2- to 4-pound range, though some have weighed in at 6 and 7 pounds. If you want to catch fish from the shoreline, fish in the early mornings before the temperature warms up. ■ Laughlin — Fishing reports mainly are coming in from Davis Dam down through Casino Row and as far south as Big Bend of the River State Park. Anglers are finding good fishing for striped bass, catfish and black bass. Crankbaits and swimbaits are catching the largemouth bass. Striped bass are most active around sunrise and sunset. ■ Las Vegas Urban Ponds — Excessive heat, windy conditions and smoke from wildland fires in California have combined to put a damper on the fishing action at most of the ponds. Several bluegill are being seen at Lorenzi, Floyd Lamb and Boulder City ponds, but the fish mostly are sticking to shady areas in the reservoirs. They are taking mealworms and small flies. Work the edges of the weed beds. ■ Kirch Wildlife Management Area — Fishing has been good in the early mornings and then again right at sunset. Those fishing Cold Springs in the evenings are finding the bass to be active on the surface and hitting top-water baits. Adams-McGill Reservoir is beginning to have algae issues, but the other reservoirs still look fairly good. Overall it’s been hot, windy, dry and smoky from the California fires. ■ Eagle Valley Reservoir — Early mornings and evenings have been the best for trout. Fly-fishers are finding good action with Woolly Buggers and nymph patterns. Seasonal growth of aquatic vegetation has become an issue for the shore fishers, as it can limit access to open water. Largemouth bass are hitting well in the evenings. ■ Echo Canyon Reservoir — Trout action has been slow, but crappie and bass have been hitting well for those working the middle of the lake or along the rocks. Fly-fishers have been doing well with brown Woolly Buggers and nymph patterns. 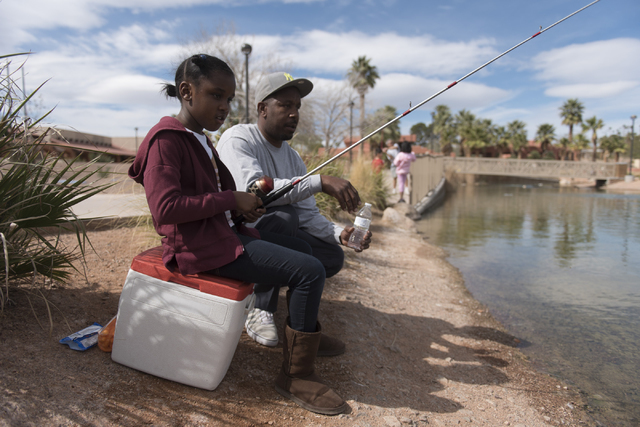 ■ Upcoming Fishing Events — The Nevada Department of Wildlife will hold a free family fishing clinic at Floyd Lamb Park on Aug. 6 from 9 a.m. to 11 a.m. Visit www.ndow.org/Education/Angler_Ed/Classes/ to register for the class. Contact Ivy Santee at 702-486-5127, extension 3503, for details.